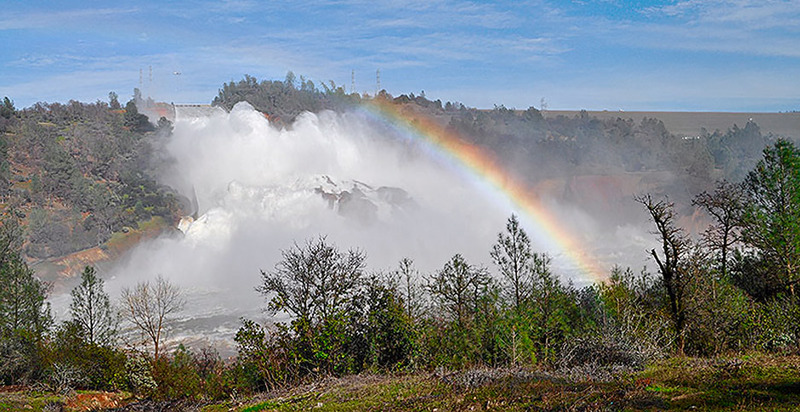 OROVILLE, Calif. — For nearly 50 years, Oroville Dam has been the linchpin of a sprawling state plumbing system that draws water from wet Northern California to 25 million people and thousands of acres of farmland in the arid south. That changed Feb. 7 when a crater as large as a football field dropped out of the dam's concrete-lined spillway. Catastrophe loomed. It appeared the earthen barrier restraining the state's second-largest reservoir might fail, unleashing a deadly 30-foot wave on communities downstream. Officials ordered nearly 200,000 people to evacuate. While disaster was averted, dam experts and savvy observers of the West's aging water infrastructure weren't shocked. "It's no surprise that you have to go back and rework dams that are 50 years old," former Interior Secretary Bruce Babbitt said. "But it's not just Oroville. It has got to be a systematic look." The country's dams are getting old. And many are damaged. There are more than 90,000 dams in the Army Corps of Engineers' national inventory. Nearly all are smaller than the 770-foot earthen pyramid here that's so large it blends into the surrounding hillside. 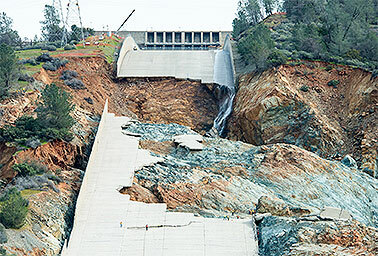 But Oroville, completed in 1968, is one of the country's younger dams. By 2025, 70 percent of the country's dams will be at least 50 years old, nearing the end of their engineered lifespans. The threats they pose are growing. Dams are considered "high hazard" if a failure would kill people. The number of those dams has grown to nearly 15,500 because of development and population growth below dams. They are already failing. In the last two years, 80 failed in South Carolina alone due to heavy rains and a hurricane, causing millions of dollars in property damage. "A lot of dams were built many years ago — in the '40s, '50s, '60s and even into the '70s," said Mark Ogden of the Association of State Dam Safety Officials. "They were built to the engineers' standards of the time. But a lot of those standards have changed and a lot of been learned about how dams perform." The price tag for repairing and upgrading the nation's dams: $54 billion, Ogden's group estimates. Climate change heightens dam risks, especially in California. The state has long had a boom-and-bust cycle of droughts followed by intense rain, as was illustrated by last month's flooding. Scientists warn that pattern will become more severe, with more precipitation falling as rain, rather than snow. That, plus rising temperatures melting the Sierra Nevada's snowpack more rapidly will intensify the strain on the state's 1,585 dams. "It isn't necessarily that it is going to be more precipitation," said Babbitt, a former governor of Arizona and a close observer of water management in the West. "It is going to be big swings when there will be a lot less sometimes, then a lot more. The Sierra Nevada is the most difficult example of that." 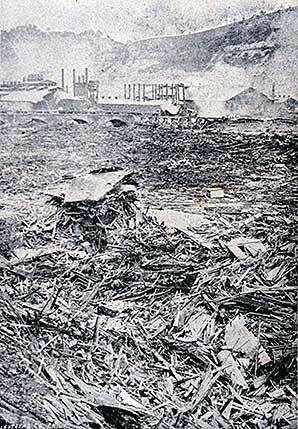 The catastrophic failure of the South Fork Dam killed more than 2,200 people in Johnstown, Pa. Photo by historic NOAA collection, courtesy of Wikipedia. In May 1889, the 72-foot-tall South Fork Dam on western Pennsylvania's man-made Lake Conemaugh gave way, unleashing a 40-foot wall of water that hit the city of Johnstown, nearly 9 miles away. More than 2,200 people were killed, 1 out of every 5 Johnstown residents. The Baldwin Hills Dam, also in Los Angeles, gave way, killing five in 1963. In 1976, the Bureau of Reclamation's Teton Dam in eastern Idaho collapsed, killing 11 and causing more than $1 billion in property damage. Martin McCann of Stanford University's National Performance of Dams Program said that since the 1850s, dams have killed probably a little more than 4,000 people — a large number, but one that pales in comparison to auto accidents, for example. "If your argument were to be based on body counts, crocodiles and deer running on highways might beat out dams," McCann said. "It's not black and white. Do we have a lot of dams that pose a risk to the public? Yeah, we do," he said. "Are they all in terrible shape? Not even close." Recent heavy rains and flooding that came in the wake of a six-year drought have revived discussions in California on whether the state needs to build more dams to store more rainfall during wet cycles. A 2014 voter-approved bond measure includes $2.7 billion for new water-storage projects, including dams and reservoirs. Those circumstances have set the stage for what is likely to be an environmental war over dams. President Trump has called for a $1 trillion infrastructure package. And while he has yet to provide specifics, U.S. EPA Administrator Scott Pruitt has suggested it include water infrastructure (E&E Daily, March 1). The president's supporters in California, including staunch ally Rep. Devin Nunes (R), want new dams. Just before he left office, President Obama signed a water infrastructure bill that expands the Interior secretary's power to authorize dam projects. It streamlines the environmental review process and included $335 million for such programs — a drop in the bucket in the world of dam finance but a major step toward new development. There are at least five storage projects that Nunes and other Republicans want to build, some relatively small and others large. Nunes and other California Republicans have introduced legislation that would roll back several environmental laws, including Endangered Species Act protections, to pave the way for the dams. Nunes predicted their bill would pass the House, and if they can get it through the Senate, Trump would sign it, he said. Trump's Interior secretary, Ryan Zinke, co-sponsored a previous version of the bill when he was a Montana congressman. And a leading candidate for Interior's second in command, David Bernhardt, once lobbied for the nation's largest agricultural water supplier, Westlands Water District in California's Central Valley. But it's not just California. There are five water storage and transport projects in the Colorado River Basin that are already in the permitting process or soon will be — two in Colorado, one in New Mexico, one in Utah and one in Wyoming, a state that's previously pledged "10 dams in 10 years." Environmentalists scoff at such proposals. They argue that all of the good locations for dams are taken. And, they say, proponents of these projects haven't figured out how to pay for them. Nunes' five projects alone would cost more than $10 billion. There are "a lot of problems for these dams projects that the Trump administration can't fundamentally fix — no matter how fact-challenged or how wonderful their rhetoric will be," said Ron Stork of the California-based Friends of the River. "Ultimately, these projects have to face reality." New projects, their foes say, would be ignoring modern, much cheaper water storage technologies, such as recharging groundwater aquifers or better utilizing flood plains. And more importantly, they say, they would be ignoring history. "There is going to be a lot of talk about building dams and let's ram them through in the next four years," said Jen Pelz, who focuses on the Colorado River and Rio Grande for WildEarth Guardians. "There is this hope that we are going to solve 21st-century problems with what we did in the 20th century," she said. Dams make civilization possible in arid areas. They provide water for irrigation, municipalities, hydropower and recreation and control flooding. But they have a devastating environmental impact. They inundate habitat, threaten native species, block fish runs, degrade a river's water quality and, in rare instances, the reservoirs they impound can cause earthquakes. And in the 20th century, America couldn't get enough of them. Elected during the Great Depression in 1932, President Franklin Delano Roosevelt, who campaigned on balancing the budget, went on a building spree. By the middle of the decade, Hoover was finishing Hoover Dam on the Colorado River near Las Vegas while simultaneously building Bonneville on the Columbia River between Oregon and Washington and Shasta on the Sacramento River in Northern California. He then returned to the Columbia to finish Grand Coulee in Washington state by 1941. The pace was astonishing. The dams cost hundreds of millions of dollars — a fortune then. Each of them qualified as the largest dams and public works projects on the planet at the time. Grand Coulee is nearly the size of San Francisco's Golden Gate Bridge — but it's solid concrete. As Marc Reisner chronicled in his history of water in the West, "Cadillac Desert," the dams of the 1930s weren't just for water development. They were to inspire Americans out of the Great Depression. "Symbolic achievements mattered terribly in the thirties, and the federal dams going up on the western rivers were the reigning symbols of the era," he wrote. He noted that in the 1920s, inspiration came from capitalistic ventures and the construction of skyscrapers like the Empire State Building. That changed in the Great Depression. "In a slip of time, the mantle of achievement passed from private enterprise to public works," Reisner wrote. "The dams announced that America could still do remarkable things; they also said that the country would never be the same." 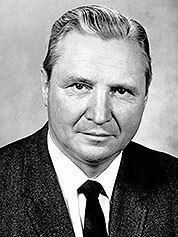 Floyd Dominy was commissioner of the Bureau of Reclamation from 1959 to 1969 and orchestrated the construction of countless dams. He died in 2010. Photo by Wikipedia. Four decades of rapid dam development followed. It peaked in the 1960s, when more than 20,200 dams were completed, according to the Army Corps' National Inventory of Dams. By the end of the 1970s, more than 62,000 dams had been built. They became pet projects for members of Congress, and nearly every important piece of legislation featured riders authorizing water development. The country's major rivers were dammed — and dammed again. In addition to pork-barrel politics, they also represented manifest destiny and the taming of the West. They allowed the government to help ranchers and farmers settle and develop a vast expanse of desert west of the 100th meridian — about halfway across the country — that otherwise would have been uninhabitable. The epitome of the mindset was Floyd Dominy, the Bureau of Reclamation's commissioner from 1959 to 1969. A political force, Dominy set out to remake the West by providing its water infrastructure. He was responsible for countless dams, including the 710-foot Glen Canyon Dam in Arizona on the Colorado River, which created Lake Powell in 1963. The vast majority of dams were finished when the country's major environmental laws were signed into law in the early 1970s. "What had begun as an emergency program to put the country back to work, to restore its sense of self-worth, to settle the refugees of the Dust Bowl," Reisner wrote, "grew into a nature-wrecking, money-eating monster that our leaders lacked the courage or ability to stop." Nowadays, about 65 percent of the nation's dams are privately owned and regulated by state programs that vary in their robustness and effectiveness. Many dams haven't been updated since the dam-building spree of the 20th century. The Army Corps, owner and operator of 715 dams, including some of the country's largest, says it has about 300 dams classified as "actionable" — meaning their risks exceed their benefits. It will take $23 billion to update those dams. The country’s 90,000 dams are ranked on a hazard scale. 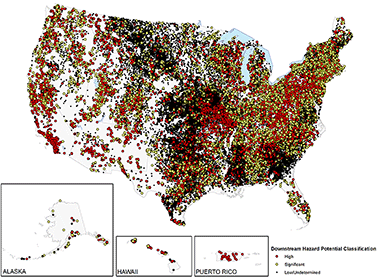 “High hazard” dams, shown above in red, would likely cause deaths if they fail. “Significant hazard” dams, in yellow, would cause significant property and environmental damage if they breached. Map courtesy of the National Inventory of Dams. "At the current rate of federal investment, those 300-odd dams will take 50 years to work through the risk reductions," said Eric Halpin, the Army Corps deputy safety officer, emphasizing that the corps is continuously evaluating those risks. Environmentalists have sought to capitalize on aging infrastructure to push for dam removals. And they have had some success, particularly for dams that no longer serve any function. 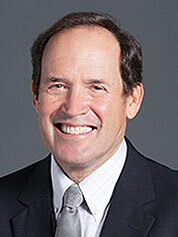 "When you begin to look at it on a coldly analytical basis, the shift in the last 40 years has been away from dam construction and toward dam removal," said Daniel Beard, the commissioner of Reclamation from 1993 to 1995 and author of "Deadbeat Dams." "The momentum is moving inexorably toward dam removal," he said. About 1,300 dams have been removed since 1912, including major river restorations like the two-dam removal on the Elwha River in Washington. In 2015 alone, 62 dams were taken out, according to the nonprofit American Rivers. And earlier this year, the William and Flora Hewlett Foundation announced a $50 million grant program for local groups looking to tear down dams. The largest and most controversial dam removal project in U.S. history — four dams on the Klamath River along the Oregon-California line that have been the source of a decadeslong legal battle between farmers, fisherman and Native American tribes — are scheduled to be removed starting in 2020. Last month wasn't the first time Oroville Dam had been in the news. In August 1975, seven years after the dam was completed, the massive lake behind the dam refilled quickly during winter storms after it was drained to repair intakes to the reservoir's power plant. Soon thereafter, an earthquake that registered 5.7 on the Richter scale hit the area. "To this day, people are still arguing over whether that was natural or a reservoir-triggered earthquake," said Art McGarr of the U.S. Geological Survey. The crater in Oroville Dam’s spillway has continued to erode as officials have flushed water out of the reservoir at rapid rates. Photo by Florence Low, courtesy of California Department of Water Resources. Smaller trembles have been attributed to Lake Mead, the country's largest reservoir behind Hoover Dam. The Oroville quake was seized upon by environmental groups the last time Republicans in Congress wanted to build new dams. That was in 1994, when Republicans took back the House and Newt Gingrich ascended to the speakership. Republicans in California wanted to revive the Auburn Dam, a proposed project on the American River near Sacramento. At nearly 700 feet, it would have been the largest concrete arch dam in California, storing about 2.3 million acre-feet of water. Construction on the project had begun in 1968, but an earthquake destroyed the early structures — and the discovery of a nearby fault scuttled it. Former Rep. John Doolittle (R), who represented the area, unsuccessfully sought to revive the project in the 1990s. His successor, Rep. Tom McClintock (R), has also mentioned the project in recent years. Friends of the River's Stork led the environmental campaign to oppose Doolittle's efforts. And he said the same playbook would be used if McClintock, Nunes or others seek to ram through new dam projects. "I remember very well when the Gingrich Congress swept into town and he put Congressman Doolittle in charge of the [House Natural Resources] Subcommittee on Water and Power," Stork said. (Doolittle was vice chairman of the panel.) "And that didn't work out so well for him." There are signs that the biggest donnybrook between the Trump administration, Republicans in Congress and the state of California won't be over immigration or climate change. It'll be about water. The water infrastructure bill signed by Obama will allow Zinke to single-handedly approve dams if certain conditions and funding levels are met — dismantling a process in which dams are vetted by a congressional authorizing committee, a protocol that has existed since the Reagan administration. And the new law allows the Army Corps to enlarge existing California dams that primarily serve a flood control purpose to also provide storage. Most observers believe Republicans in Congress and the Trump administration won't be willing to provide the massive federal subsidies necessary for new dam projects that likely don't pencil out. And the priority, they say, should be repairing existing, aging dams. California Gov. Jerry Brown (D) submitted a $100 billion infrastructure wish list to the Trump administration that includes smaller water storage projects, such as enlarging San Luis reservoir in Merced County and raising Folsom Dam near Sacramento. Jeffrey Mount. Photo courtesy of the Public Policy Institute of California. "The question gets asked every year, would it make sense to build dams for flood control? And the answer is, no, it doesn't make economic sense," said Jeffrey Mount of the nonpartisan Public Policy Institute of California. "It is worthwhile to pose a fundamental question: Don't you need to fix the ones you have before building new ones?" he said. California already has three dams that need upgrades due to seismic risk — the Anderson and Calaveras dams near San Jose (price tags: $400 million and $810 million, respectively) and the Lake Isabella Dam near Bakersfield (price tag: $500 million). But repairing or updating dams isn't nearly as exciting as building something new, as Roosevelt and Dominy proved. And that may be particularly true for a president who is a real estate developer. Environmentalists would prefer other water-storage projects and say Republicans and the Trump administration would be wasting their time on new projects. "We spend all this time and political capital on them when our existing infrastructure is crumbling," said Democratic Rep. Jared Huffman of Northern California. Oroville, he said, should snap that cycle. "If that's not a perfect wake-up call," Huffman said, "then people aren't paying attention." Coming next week: The country’s largest — and most controversial — dam removal project.